The picturesque and historic Nyhavn Canal dates from 1673 when it was built to connect the inner city to the sea. Today, it's jokingly referred to as the longest bar in Scandinavia because of the numerous restaurants, pubs, and cafes fronting the pretty pastel-painted townhouses. The canal itself is crammed with old wooden sailing ships which only add to the atmosphere. The area is strongly associated with fairytale writer Hans Christian Andersen, who occupied three houses in the district throughout his life. The house at number 20 is open to visitors. Visitors can take one of the many boat trips on offer to explore the canal and familiarise themselves with the area. 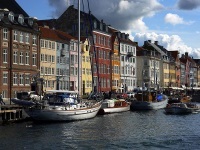 The Nyhavn Canal is a must-see for tourists visiting Denmark and it never fails to charm. But it can get very crowded and visitors must stay vigilant with their belongings as it is a popular pickpocket haunt. The eateries can be pretty expensive but just strolling around this vibrant and visually exciting area will delight visitors, and there are plenty of great photo opportunities.